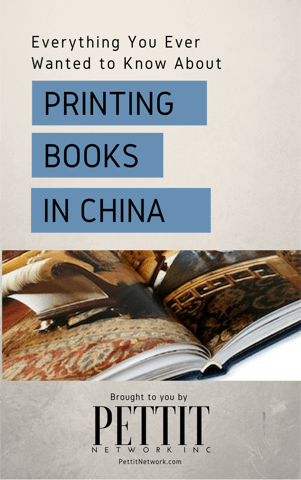 Pettit Network Inc has been book printing in China since 1992. Each book project is given careful attention to detail throughout it’s production and delivery. We have excelled at international printing for 27 years. We are committed to customer satisfaction by attentive, streamlined, management services. Combining our extensive book printing management experience and overseas printing capabilities to produce the quality books that our customers expect: all within budget, on time and within a framework of social and environmental responsibility. Creating beautiful, well crafted books is our passion. Pettit Network books are the result of an attentive and specific proofing process that hinges on successive customer approval every step of the way. We do not proceed to the next phase without approval of the present phase, assuring customer satisfaction and quality. Pettit Network has been printing in China through Asia Pacific Offset Limited (APOL), which streamlines our communications and production cycles. Designated managers are attentive to the details of each international printing project, directing them to specific overseas printing facilities in Hong Kong and/or mainland China according to the printer’s unique capabilities. Accomplishing sometimes difficult ideas. We like challenges! Our partnership customer lists include some of the most prestigious publishers in the world. From those producing collector type books to medium and small publishers, from self-publishers to commercial businesses producing promotional books for their products, we provide options for large and small sizes, and large and small quantities with every type of case material treatments and bindings you can imagine. You can be sure your international printing project is in very capable hands. We not only have a long tradition of excellence, we silently strive to be ahead of the game as technologies change.